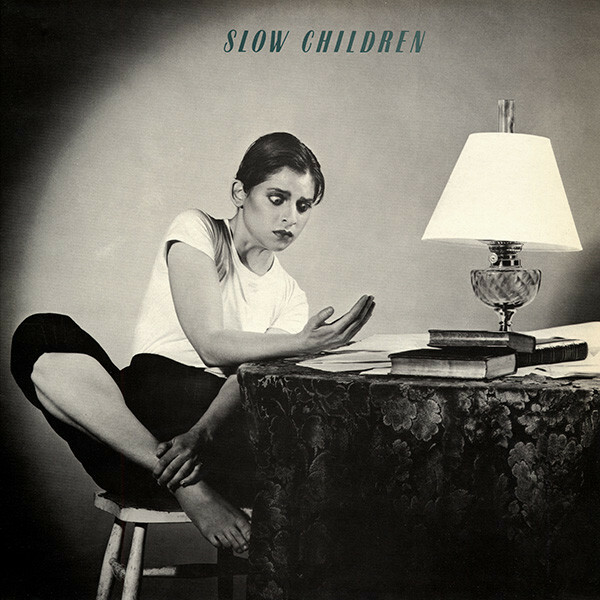 Last month I was in a record store and found a US Promo 12″ single from Slow Children. I first heard them on RCA’s great 1981 compilation album “Blitz,” and I wasted no time in buying both of their US LPs. Of all of the US based synthpop US bands, I felt like this one really delivered the goods. The duo was Andrew Chinich on guitar and Pal Shazar on vocals. They wrote nervously overwrought, intellectopop songs that were whip smart and dropped any lyrical references they cared to whether you understood or not. In other words, they did not sing down to their audience. Their secret weapon was the fact that the major half of Jules + The Polar Bears [Jules Shear, Stephen Hague] played synths and respectively produced the two albums. This was my first exposure to the production of Hague, and while I’ve had my issues with his work, these records were dynamic and the production definitely added lots of hooks to the kinetic songs. In the new century, I’ve even managed to get a scarce UK pressing of their debut album, with very different contents to the much more common US edition which I purchased in 1981-1982 on its release. As usual, RCA meddled with the tracks, substituting a longer 3:20 mix of “Spring In Fialta,” which was 2:20 on “Blitz.” It also lopped off “Malicious” and “Ticket To France.” I need one more single and I can make REVO editions of both albums with bonus tracks. Fortunately, the Promo single I bought last month, just because it was there, featured an even longer mix of “Spring In Fialta” at 4:29! “President Am I” is one of the great New Wave songs. The obdurately synthetic production and arrangement calls attention to its contrivance. The petulant tone struck by Ms. Shazar’s vocals achieved a kind of perfection. Lending the lyrical delivery just the degree of defiance necessary to earn our empathy. The extended remix here began with two bars of isolated rhythm before diving in. The song dubs out the DEVO-like rhythm tracks at the middle eight while adding a new minor-key countermelody for several bars and dubbing the vocal refrain of “hard time” before snapping back with one last “thwack” of the drum machine. It’s a perfect pop song to these ears. Hopefully, the 7″ version below will suffice for those who’ve not had the pleasure. Meanwhile, the B-side to this promo was the extended 12″ mix of “Spring In Fialta,” a song that was not on the album in the UK version. As great as “President Am I” was, this was the first Slow Children song to reach my ears and it was more than enough to make me a fan. First of all, the drums here were real as it was an earlier single, recorded before the debut album. The bass pulled my ears into the song as the tension ramped up and by the time that Ms. Shazar began singing, a jittery two note oscillating synth figure at double time to the song’s already nimble tempo sufficed to take the levels of anxiety the song exuded through the roof. The relentless synth hook of the song really made this song a one way ticket to Twitch City. 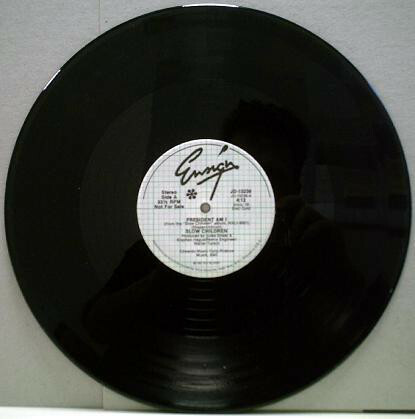 The 12″ version here was even longer than the “extended mix” on the first US album. The track went into a generous dubspace zone for a minute and a half, but this was tense, nervous, dub. Something new under the sun. And as for the song itself, apparently it’s based on Vladimir Nabokov’s short story of the same name. Let’s leave the obvious Nabokov references to Sting; this one was far more esoteric. And we have the full 12″ remix to hear below this time. Pal Shazar has a Slow Children website and she rejoined forces with Andrew Chinich for a third album in the new millennium that is a DL only exercise that I will have to check out. The “Cottoncloud 9” album came out two years ago and one day I should buy a copy. I was lucky enough to see Shazar and her husband Jules Shear give a show in Asheville back when they lived here for a time in the noughts, so against all odds, I have seen this lady sing! I’m still shaking my head over the odds of that happening even now. As ever, she had a portfolio full of fascinating songs, albeit not in the technopop vein of early Slow Children. This entry was posted in Record Review and tagged Pal Shazar, Slow Children, Stephen Hague. Bookmark the permalink. Another favorite of mine. “Spring in Fialta” is what hooked me. The alternative radio station played it a lot, which got me buying the 12″ and the rest of their vinyl. I never get tired of listening to Fialta, someday I’m going to edit my own 11-minute version of it. I still can’t believe none of their stuff made it to CD! 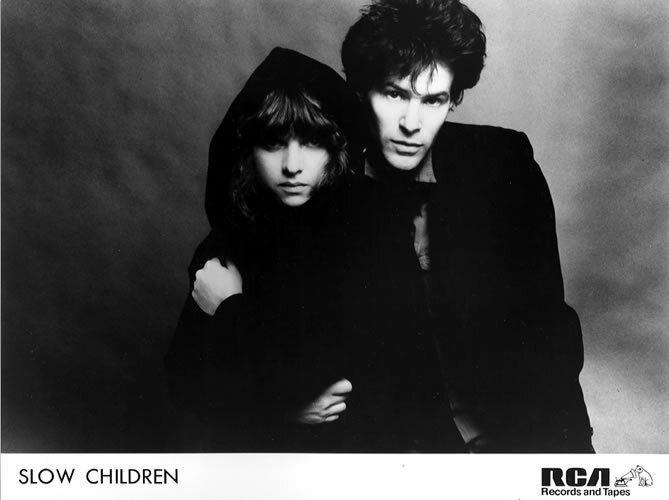 I always wondered what it would have been like to hear a collaboration with Slow Children and Lene Lovich! The “Mad About Town” album, if I could add Spring in Fialta, would definitely be on my Desert Island Discs list. There was a guy that assembled rare vinyl albums + bonus tracks to CDs, kind of like your REVO CDs, and sold copies, so I have his versions of both the first album and Mad About Town. His quality was pretty good, so it was easier than digitizing everything myself. I *kinda* feel like I have CD versions of their releases, but I would jump at any official CD release. MathManDan – Slow Children and Leone Lovich…..? I can sort of hear that! Good call. I need to remaster my two albums. It’s been decades since I’ve heard them. Was this Rubellan by any chance? I bought his CD-R of the first album many years ago. Wish I’d bought both now. SimonH – Wha…?! Rubelllan went rogue early on? He’s fully legit now, of course, but I’m surprised to hear that he got his start selling backroom CD-Rs. Especially considering his stance on NWO forum/Discogs regarding pirate CDs. It was a long time ago, maybe 15 years! I bought a few excellent CDs from him some of which remain unavailable on cd to this day, for example Modern Eon. His list back then was something of an Aladdin’s cave of rare new wave. It wasn’t Rubellan that I got these from, it was some guy who went by “Romoboy.” He only sold CD-Rs of stuff that was out of print, vinyl-only, etc (at the time). I bought a bunch of nicely done CDs that I already had vinyl for, like compilations of all the Wide Boy Awake tracks, SPK Machine Age Voodoo, Shriekback Jam Science, Dr Calculus, Dalek I Love You, Chakk, Hohokam, singles and rare track compilations of Associates, OMD, Visage. MathManDan – That makes sense! I would have been shocked at Rubellan doing that. But “Romoboy.” That’s a name I know from somewhere… but where? Associates mailing list of the late 90s? Hmm that’s possible, I have a bunch of CD-Rs that the fans traded around back then, maybe he was one of those fans? Rubellan definitely did mine! That and another six or seven discs that I still play to this day.